Why Did Nehru Want the People’s Republic of China in the United Nations? Right from the establishment of the Peoples’ Republic of China (PRC) in 1949, India’s first Prime Minister Jawaharlal Nehru was clear that the PRC was not an ordinary power. Nehru underlined that the PRC was a “well-established fact” and that excluding the PRC from Security Council was an “unrealistic state of affairs,” recalls Dr.Nabarun Roy in his article in The Diplomat. A basic insight from international relations theory is that as the power of a country increases, so does its ambition. India is no different in this regard. As its military and economic power has increased in recent times, so has its desire to gain recognition and play an important role in world politics. A key aspect has been India’s demand that it be accorded a seat as a permanent member at the UN Security Council. Indian leaders have used various platforms including the UN General Assembly to remind the international community of India’s suitability as a permanent member. The results have not been entirely disappointing. Prominent powers like the United States, the United Kingdom, France, and Russia have shown enthusiasm toward India’s call for membership to different degrees at various points. However, a notable opponent has been the People’s Republic of China (PRC). In the contemporary context, this is not surprising given that India and PRC do not enjoy the smoothest of relationships. The two have a long, disputed border running along the Himalayas that has given rise to considerable tension and war-mongering, most recently during the face-off in the Doklam region in 2017. India and China are also engaged in seeking influence and strategic toeholds in the South Asian region and the Indian Ocean region. With both countries being led by nationalist leaders, the competition has become very keen. However, the PRC’s unwillingness to back India’s bid at the UN is surprising when viewed over a longer time horizon. For, in the 1950s, India was a strong advocate that PRC be admitted to the UN and that it take China’s seat as permanent member at the Security Council, which was at that time occupied by the Republic of China (Taiwan). Since the emergence of PRC in 1949, China had been represented by the ROC’s Chiang Kai-shek regime and not by Mao’s PRC. The United States was instrumental in denying the PRC the seat at the UN owing to Cold War calculations. It was Jawaharlal Nehru who advocated PRC’s case as regards the UN. Why did Nehru back the PRC’s case for UN membership? 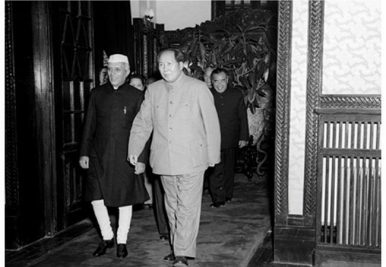 Some believe that this was Nehru’s ploy to appease Mao in light of increasing acrimony between India and PRC in the 1950s. Unwilling to ramp up military expenditure, the theory goes, Nehru found it prudent to humor Mao and stave off any showdown. Others argue that Nehru’s misplaced enthusiasm for Asian solidarity, where he saw India and the PRC as being fellow travelers in the broader historical journey, led to him supporting the PRC. Broadly, most ascribe Nehru’s stand to his idealism and lack of appreciation about the “truth” of international relations – that power matters and needs to be engaged wisely. There is no doubt that Nehru did loathe the amoral politics of his times and the zero-sum rivalry that world politics was caught in. However, what many have totally missed is that Nehru’s reasons for supporting the PRC at the UN had a lot to do with his reading of history and his views of the salience of power among nations. To understand Nehru’s stand, one needs to set the clock back to the early years of the 20th century. A reading of the great power politics of that time had convinced Nehru that great powers ought not to be shunned by their peers. Instead they had to be accommodated in global organizations commensurate to their standing and power. Not doing so led them to become dissatisfied and difficult entities that constituted a threat to stability. Nehru believed that the shoddy treatment meted out to Germany after World War I and its sense of humiliation saw it drawing closer to another dissatisfied and ostracized country – the USSR. In April 1922 Germany signed the Treaty of Rapallo with Russia, which heightened tensions in Europe. Timely action by the British allowed for Germany’s rehabilitation and it became a League of Nations member in 1926. The Great Depression, however, let loose forces within Germany that saw it again become a threat to stability. To Nehru, it was clear that great powers had to be accommodated and not vilified since the latter action could make them unpredictable and dangerous. It is this logic that guided his behavior toward the PRC as regards its place in the UN. In 1960, Nehru argued that it was “absurd” to have the ROC represent China at the UN. He believed that “the whole balance of power has changed not only in the Far East but in the world because of this new China.” Not accommodating the PRC in world politics was not only foolish but dangerous. Prudence dictated that the PRC be provided a status commensurate with its power and that it not be shunned. What made it imperative to engage with the PRC and accommodate it in global power structures was the fact that it was a strong country but with an “abnormal state of mind” which was “very, very far from normality…” Nehru pointed out to Gamel Abdel Nasser in New Delhi in March 1960 that “China…constantly talks of losing millions of people. Very casually Mao himself told me five years ago that they could afford to lose a few hundred million people.” Furthermore, the PRC was the product of a revolution and all revolutions are “a departure from normal behavior…” The PRC’s posture and radicalism, Nehru believed, stemmed from its isolation and it being denied great power status. China had been at the receiving end of “insolent treatment” from imperialist powers. This had made China a very prickly state. Nehru also observed that China had demonstrated aggression in the past. A historical tendency toward aggression combined with a contemporary sense of grievance would be very dangerous. For Nehru, the cost of having a neighbor that was extremely dissatisfied and on whom international strictures and resolutions seemed to have limited effect was a clear and present danger. Even though the PRC was not an immediate danger to India in the early 1950s, the fallout for India, should the PRC come to blows with the United States in the region, would be cataclysmic. The Korean War showed Nehru that this danger was very real. In an age when military alliances were weaving countries ever closer in webs of suspicion and with the presence of nuclear weapons, the chance of India getting engulfed in great power competition was quite real. Faced with the different kinds of challenges posed by the emergence of the PRC in 1949, Nehru deemed it wise to get the PRC accommodated at the UN, take the sting out of its tail, and helping to lower tensions. At the heart of Nehru’s action and advocacy were not pious thoughts but the realization that great powers could not be excommunicated from the comity of nations. The price of doing so could be disastrous. The piece is a shorter version of the article “In the Shadow of Great Power Politics: Why Nehru Supported PRC’s Admission to the Security Council” published by the author in the journalThe International History Review. (Dr. Nabarun Roy is Assistant Professor in the Department of International Relations, Faculty of Social Sciences, at the South Asian University, New Delhi. He has a Ph.D. in Political Science from Carleton University, Ottawa, Canada).